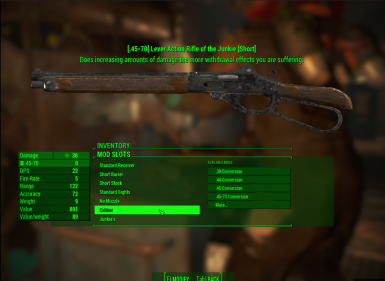 Adds a new mod category for Lever Action rifles called "Caliber", that lets you change the ammo it uses, like .38, .44, .45, .50, 10mm, 5.56, .308 and shotgun shells. Added 5.56 and .308 cal conversions. Now using appropiate projectiles for each conversion. Changed damage values depending on ammo. Removed "better rate of fire" and "better reload speed" changes from conversions, since they didn't make sense. Added range modifiers depending on ammo. Balanced weight and value modifiers. Makes sure NPCs use the correct ammo when using a converted rifle. Fixed the double attachment entries bug. 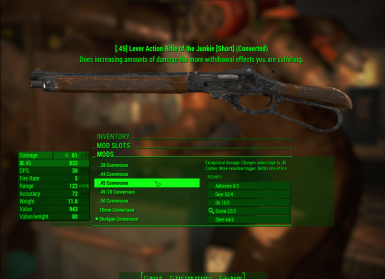 This is a small mod that adds a new mod category for Lever Action rifles called "Caliber", that lets you change the ammo it uses, and it's independant of which receiver it has. Damage, rate of fire and value is changed accordingly. Download and install with NMM. Lever Action Rifle Reload Fix - Patch no longer needed as of version 3.0+ of that mod.